A ticket to the most expensive NFL Wild-Card game this weekend is currently trending at $655, according to TicketIQ.com. That’s right; $655. To put that in perspective, that’s more than two times as much as the next most expensive game and about $200 more than fans are willing to pay to see the New England Patriots host an AFC divisional game the following week. So just who are fans willing to pay $655 to see play? Believe it or not … the Jacksonville Jaguars and Buffalo Bills. At first blush, the price seems outlandish until you consider this: Neither the Jags nor the Bills have been to playoffs in a decade. In fact, the Bills haven’t played in the post season this century. Their last trip to the playoffs was in 1999. The Jaguars, who host the Bills Sunday, were last in the playoffs in 2007. EverBank Field seats 67,164, making it one of the smallest stadiums in the league. The winner of the game will go on to play either the Patriots or Pittsburgh Steelers, both of which have a first-round bye, in an AFC divisional game. 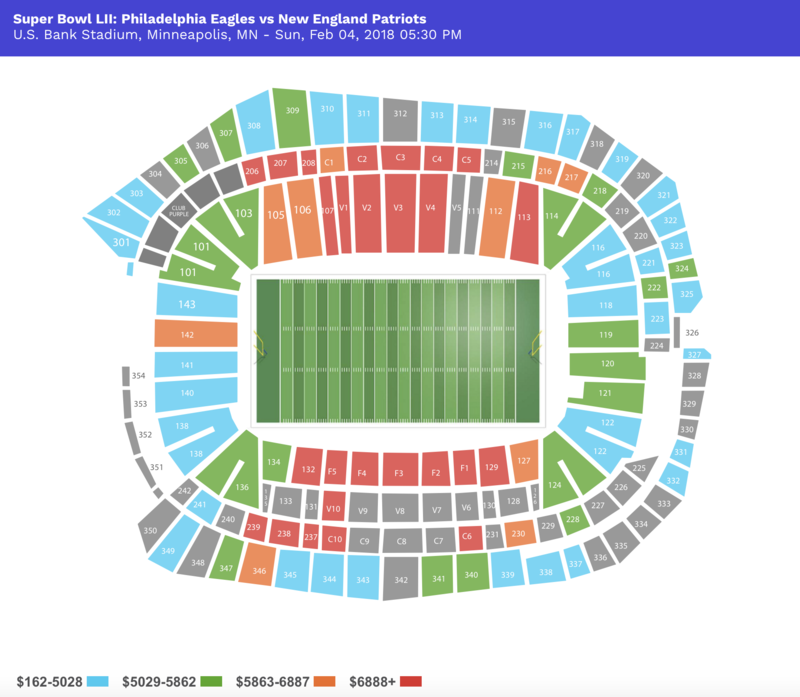 The get-in price of $203, according to TicketIQ.com, is more than current average asking price for a ticket to either the Los Angeles Rams or Kansas City Chiefs games this weekend. Drew Brees is the second-oldest quarterback in the NFL, but don’t mistake age for lack of ability or mobility. Both Brees – and the NFL’s oldest quarterback, Tom Brady – are going to the playoffs. Brees, 38, is leading the best offense in the NFC (391.2 yards per game) and has the second most passing yards in the conference with 4,334 yards and 23 touchdowns. Those numbers add up to the Saints first post-season appearance since 2012. 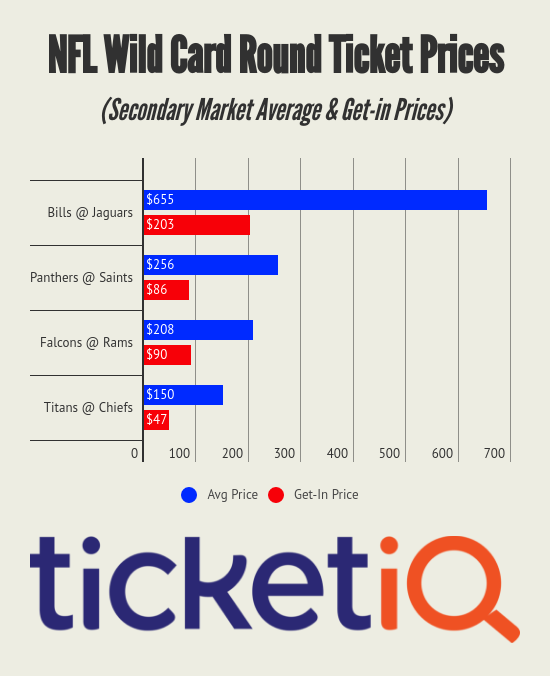 Despite the success on the field, ticket prices for Sunday’s wild-card game against the Carolina Panthers are the cheapest a playoff ticket has been in New Orleans since 2010, when TicketIQ.com started tracking prices. In fact, the current asking price of $256 is nearly $130 less than a wild-card ticket in 2012 ($384) and more than $225 less than a similar ticket in 2010 ($487). Winners of the NFC South, the Saints and Panthers both finished the season with 11-3 records, but the Saints went 2-0 against Carolina during the regular season. The game will mark the first post-season affair at the SuperDome since 2011, when New Orleans defeated Detroit in a wild-card game. The Saints found their way into the playoffs this season by mounting an eight-game win streak after losing the first two games of the season. Should the Saints win, they’ll go on to play an NFC divisional game at either Philadelphia or Minnesota, both of which have a first-round bye. In their second season since returning to Los Angeles from St. Louis, the Rams won the NFC West going away. While their 11-5 record wouldn’t have been enough to win five other divisions outright, it was plenty in West — the second-place Seahawks were 9-7. The Rams are making their way to the playoffs on the back of running back Todd Gurley, the leading rusher in the NFC who rolled up 1,305 yards in the regular season, and second-year quarterback Jared Goff seems to have found a rhythm. He’s No. 10 among starting quarterbacks with 3,804 yards and 28 touchdowns. The Rams are in the playoffs for the first time since 2004. The Falcons are the only third-place team to get into the playoffs. They finished the season at 10-6, behind the Saints and Panthers in the NFC South. Losers to New England in the Super Bowl last year, Atlanta has never played the Rams in the post season. TicketIQ.com has a healthy inventory of tickets left to get into the game and the average asking price is $208 while the get-in price is $90. The game will be first post-season NFL game at the L.A. Coliseum in 22 years. The winner of the game will play either the Philadelphia Eagles or Minnesota Vikings, both of which have a first-round bye, in an NFC divisional game. Behind the top rusher in the NFL, the Kansas City Chiefs have made the playoffs for the third consecutive season for the first time since the 1990s. Kareem Hunt ran for 1,327 yards in leading the Chiefs to their second straight AFC West title. While it cost $271 to see the Chiefs one post-season game last year – a loss in an AFC divisional game to the Steelers – the average asking price for a ticket this time around is relatively cheap, according to TicketIQ.com. As of Jan. 2, fans could buy a ticket to Saturday’s game for an average of $154. That price, according to TicketIQ.com, is the lowest of the Chiefs last three post-season appearances, dating back to 2011. The cost to get into that game, a wild-card affair against the Ravens, was $206. On Saturday, fans can snag a ticket for as little as $47 and TicketIQ.com has 8,242 tickets in inventory. Should the Chiefs win, they’ll go on to play either the New England Patriots or Pittsburgh Steelers, both of whom have a first-round bye. The Chiefs lost to the Steelers in a divisional game last year and to the Patriots in a divisional game in 2016.